Crocheted potholders always evoke a strong feeling of simple living for me. Walking into the kitchen of my grandmother's farmhouse, I could smell the freshly brewed coffee and home-made bread baking in her oven. She would be hovering over pans and a skillet and always -- a crocheted potholder tucked into the strings of her apron. These are the fondest of memories for me. I cherish them & try to recreate them. Using this same book -- Kitchen Basics in Cotton, I crocheted this Irish Rose Potholder. With Peaches n Cream crochet cotton and a size H hook, I used colors that bring to mind those images of a simple, country life. But hanging from an apron string, now that might just be the thing. Very neat. I love the colors even if they would not go in my kitchen. Your potholder is lovely! I am having fun crocheting vintage potholders. Always looking for new ways to display them as I can't bring myself to use them..LOL. I really enjoy your blog. I love this potholder. Vintage. Perfect. 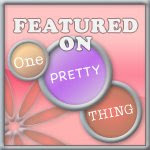 I am off to my blog to put you back on my blogroll...had an oopsie a while back and erased the darn thing. Now, I am slowly adding my friends back.....it was a job to fix, I'll say. I hope all is well with you. I'm glad to know you and your beautiful blog! that is so beautiful. I'm back and checking to see if you've made chatelaines to sell yet! LOL I really, really liked it and can't get it out of my head! I'm hosting a quilt giveaway, why don't you come for a visit and check it out? Simply beautiful. I feel the same way. I think I live in the wrong era. 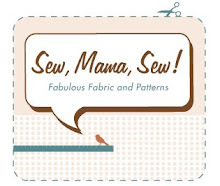 Oh to our grandmothers and their hard work! No, please no cheese on such a work of art! Another gorgeous creation! As you say, sticky gooey cheese would not match at all! lol. wonderful colours, where can I find this pattern? You had made another beautiful item, loving your blog! Fantastic!! Love the color combo and peaches n cream is one of my favorite yarn co. So glad I found you through Jess!! 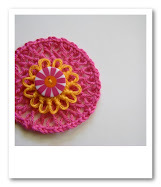 I just came to your blog because a German blogger linked to it and your wonderful fabric flower tutorial. Then I immediately was impressed by all your beautiful crochet. And now this hot pad - I love it so very much, it´s simply gorgeous, the colours and your design. It´s so funny because I have made some hotpads just recently and blue mixed with white and red is my very favorit colour combo. Yours is perfect! I know; I'm repeating myself: Absolutely beautiful ! This potholder has the perfect country style I love. Such beautiful colours.